Selecta J-Man has been on absolute fire this year and his productions have only gone from strength to strength stamping his mark deeply within the Ragga-Jungle scene. This EP is a homage to his first release with us and encumbers all things we love about his sound. We invited 8 producers and friends to give us there take on the Cease & Sekkle EP. With 4 Jungle cuts and 4 Reggae cuts you wont be short of ammo for the bag this winter! The Born On Road family grow stronger and stronger by the day and Selecta J-Man is integral to the development of their sound. BoR HQ is a busy hub of producers and DJs pushing to further the modern Drum & Bass Jungle sound and J-Man ties this all together with his team: Aries, ,Kelvin 373, Gold Dubs and Stivs. When Drum & Bass met Reggae it spawned a whole new field of interest for the new school of producers who were addicted to taking foundation Reggae music and marrying it with rolling Drum & Bass. It’s un-pretentious approach to reinventing the ideals of Reggae into something that the UK ravers could hold as theirs has shown once again that Drum & Bass will never die and Selecta J-Man is one of these producers who is working with the Reggae greats. Never one to boast, Selecta J-Man has engineered studio sessions with Protoje, Solo Banton, Deadly Hunta, London Posse, YT, Charlie P, Junior Dangerous, Eva Lazarus and Gardna amongst a wealth of others so his dubplate collection is unrivalled in the scene. It was this recording flare that has allowed him and his label Born On Road to take the Glastonbury Sound Clash crown in 2017 from the jaws of the renowned Shadow Demon Coalition. 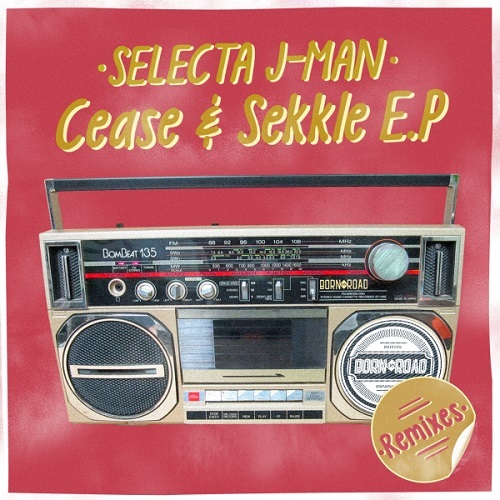 It’s fair to say that Selecta J-Man has been welcomed into the scene with open arms by a wealth of established artists, perhaps most importantly good friend Aries who has kept a steady workload throughout his career and was instrumental in bringing J-Man’s sound up to par and introducing him around the world of Junglists. Selecta J-Man’s releases have centred around Born On Road with the common championed theme of Reggae and Drum & Bass but we don’t forget his first releases on Run Tingz Recordings and also his remix duties for Boom Sound and Chopstick Dubplate. With his consistently bright attitude to making great tunes that punch hard and his commanding presence behind a set of decks, Selecta J-Man is a Drum & Bass Junglist who is here to stay. NOW this dangerous Cease and Sekkle remix EP from Born On Road is quickly taking over. Selecta J-Man picked just the right guys to carry on the momentum following the huge original release. Carrying on with that same Born On Road vibe. True Tactix, Audiomission, Aries, Marcus Visionary, Lost City,Rukus, Origin One, and FLeCK fully continue to bring that true heat to the Born On Road sound.